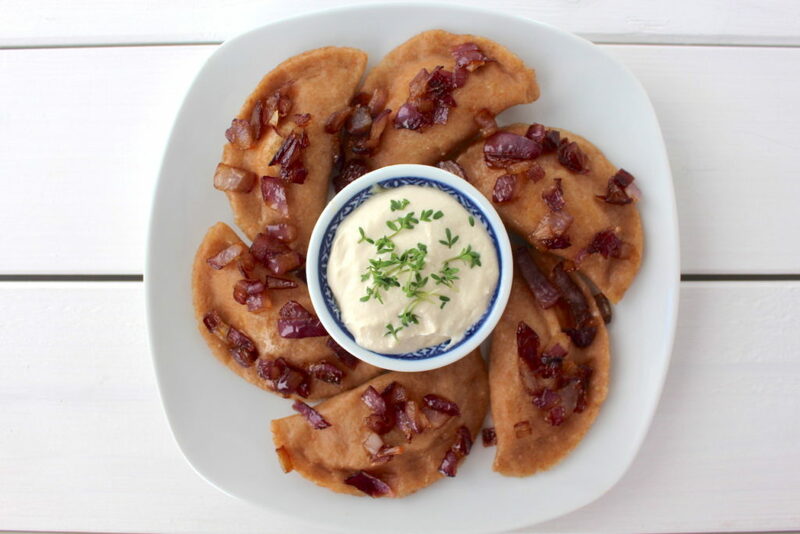 For those of you who don’t know (please tell me I’m not the only one): pierogi are filled dumplings, kind of similar to Italian ravioli but typically served with caramelized onions and melted butter, sometimes with sour cream. Typical fillings include potato, sauerkraut, meat, lentils, mushrooms, and even fruit. At the café in Warsaw I had a few vegan pierogi filled with potato and “cheese” and some with a fava bean filling. Both kinds were delicious! 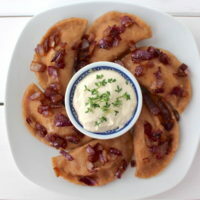 I love potatoes, hence filled my first homemade pierogi with mashed potatoes, sour cream and onion. They were delicious, but next time I’ll roll the dough a lot thinner and I’ll probably use regular (spelt) flour instead of wholemeal (I wanted to do so anyway, but wholemeal spelt flour was all I had on hand). 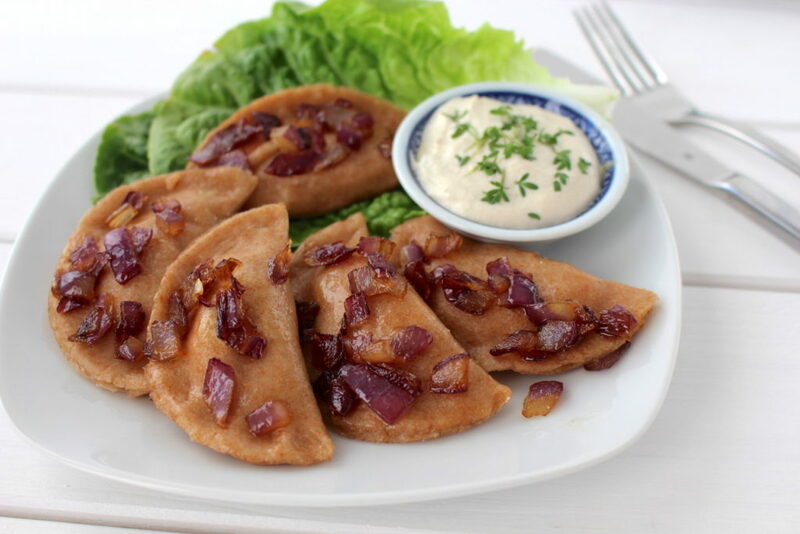 This recipe for vegan pierogi makes about 45-50 pieces, depending on the size. I recommend rolling the dough as thin as possible. Fill these pierogi with mashed potatoes and sour cream/ sauerkraut/ mushrooms/ fruit or anything else you like. If making sour cream from scratch, prepare in advance. Peel and cut potatoes into cubes, then cook in salted water until fork tender (about 20 minutes). For the dough, combine flour, water and oil in a large bowl, and mix until dough forms a ball. If the dough is dry, add more water (1 tbsp at a time). If the dough is sticky, add more flour (1 tbsp at a time) until it’s smooth. On a floured work surface, knead dough 3 or 4 minutes or until elastic. Allow to rest for a few minutes while preparing the filling. Finely mince onion and sauté in some oil or margarine. Mash potatoes and stir in sour cream, sautéed onion and margarine (if using) and season with salt and pepper. Caramelized onions: dice onions or cut into strips and place into a pan with some oil. Set over medium-low heat. Allow to cook, stirring occasionally, until the onions become very soft and light brown, about 15 minutes. Optionally, sprinkle with some sugar and fry for another minute. Set aside. On a floured work surface, roll the dough out thinly and cut with a round cookie cutter or glass (my glass was about 3 in/ 8 cm in diameter). Using a teaspoon, place a portion of the filling into the middle of each circle. Keep a little dish of water nearby and damp the edge on half of the pierogi. Then fold over and slightly pinch the dough together. Boil pierogi in a large pot with water and salt for a couple of minutes until they float to the surface. Optional: Add boiled pierogi into a hot pan with some margarine/ oil and fry them until they’re golden brown outside. 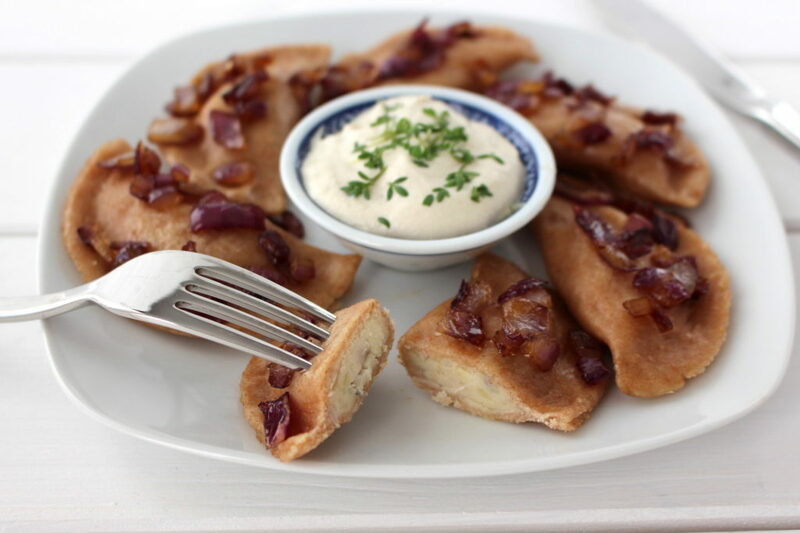 Serve with caramelized onions, fresh herbs and sour cream. Check out this easy recipe to make vegan sour cream from scratch. You can prepare pierogi and keep them in the freezer (or fridge for a few days) before boiling them. I hope you love this recipe – please let me know in the comment section below! If you make these pierogi, make sure to take a photo and share it on my Facebook page or on Instagram, using the hashtag #minamadefood. Oh and don’t forget to tag me (@thisisminamade) so that I can see your creations!